Looking back at Brad Baxter’s relatively modest NFL career, it was surprising he didn’t go higher. While at Alabama State he finished with 3,728 yards, 30 touchdowns, and 19 100 yard games. These accolades alone would garner strong praise in today’s NFL scouting circles, but he probably carried the ‘small school’ stigma. Originally an 11th round long shot out of Alabama State by Minnesota in the legendary 1989 draft, Brad Baxter did not make the roster of the talent deep Vikings. In fact, while the ’89 draft is considered one of the stronger ones in the modern era, it was disastrous for the Vikings’ front office. Still even after being cut by the Vikings, Brad believed in himself, and embraced his underdog status. The New York Jets picked him up quietly and placed him on their developmental squad before the season was out, and he played on special teams in the team’s season finale. As head coach Joe Walton was shown the door after the 1989 season, the Jets front office decided to bring in Bengals offensive guru Bruce Coslet to coach the team. With Coslet, came a new offensive philosophy, and for Brad, -an opportunity. 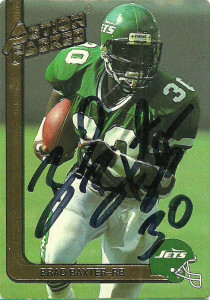 The Jets in fact had so much confidence in Baxter, they let incumbent 1st round choice Roger Vick go. Brad did not disappoint. He’d be one of the best blocking backs in the league, handling the load for guys like Blair Thomas, Freeman McNeil, and Johnny Hector. The team as a whole was 4th in the NFL averaging 132.9 yards per game. 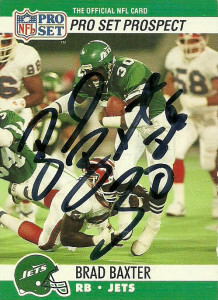 Baxter also got into the act rushing for a club rookie (on technicality) mark with 6 rushing TDs, and paired with Thomas to be the first duo of Jets rookies to finish with 500+ yards rushing in a season. In fact Baxter’s 539 yards, were only second to Thomas among all AFC rookies that year. 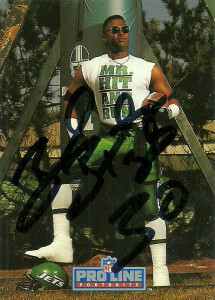 Mr. Hit and Run followed up 1990 by leading the AFC with 11 rushing touchdowns in 1991, matching a team record, as the Jets discovered Smooth’s nose for the end zone. His 666 yards rushing were second again to teammate Blair Thomas. 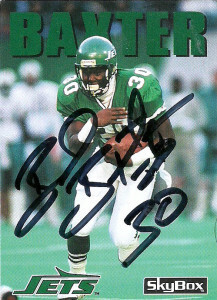 In 1992 Baxter led the team and ran for a career high 698 yards as the Jets struggled under a quarterback transition from Ken O’Brien to Browning Nagle. Johnny Johnson assumed the majority of the running load from Blair and Brad, as Boomer Esiason joined the team at quarterback in 1993, but Brad still managed to garner 559 yards and 20 receptions. Again, Brad survived another coaching transition with Pete Carroll taking over for Coslet in 94, and Rich Kotite for Carroll in ’95. In the meantime Brad had gotten into an odd side business- cattle hauling. This caused quite a stir when he opted not to show up at ‘voluntary’ mini camp over the summer in order to manage it. OC Ron Earhardt apparently took it as a cardinal sin, and gave the job to Richie Anderson. Baxter, while a fine blocker and rusher, did not tally high numbers receiving and the new coaching staff saw his lack of willingness to participate in mini camp as a liability. Baxter was cut after 7 seasons. The Jets then went 1-15. Many fans today still consider Brad as the best blocking back the franchise ever had, as even in those lean years through all those bad teams and a turnstile of coaches, Baxter could be counted on the champion the runningback in the ground game, clearing paths, or finding a little wiggle room himself. I absolutely detest the Proline 92 set. While it was ground breaking at the time, with its nameless cards, and displaying players frequently not playing football, this card of Baxter absolutely charmed me. It is so wacky, and really frames everything about that era of the sport. I had to get it signed. Brad also was a nasty one two punch along with Blair Thomas in Tecmo Super Bowl.